Got Kids? Got dried up markers? Yeah, me too. 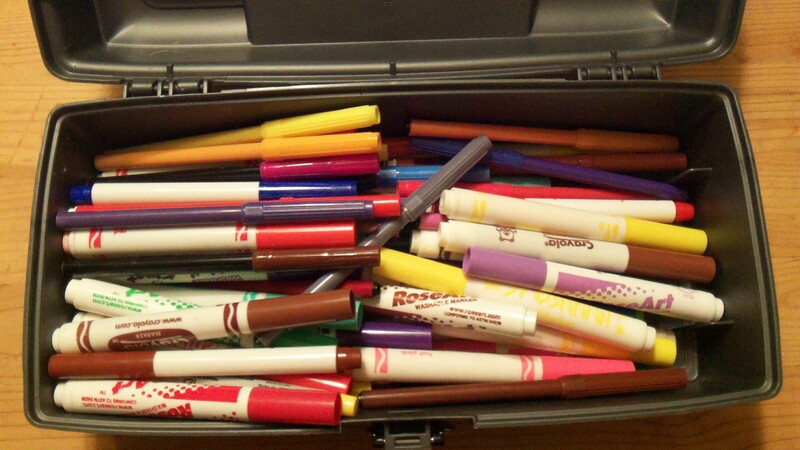 My kids have so many markers that we keep them in a tacklebox. I think they breed in there. The time had come to cull out the old nasty dried up markers and I thought, “Surely there is something I can make with dried up markers!” Enter my friend, Google, who helps me solve all the problems of my life and learn new stuff at the same time. The first idea, which is quite cool, is a mini science project on tornadoes. 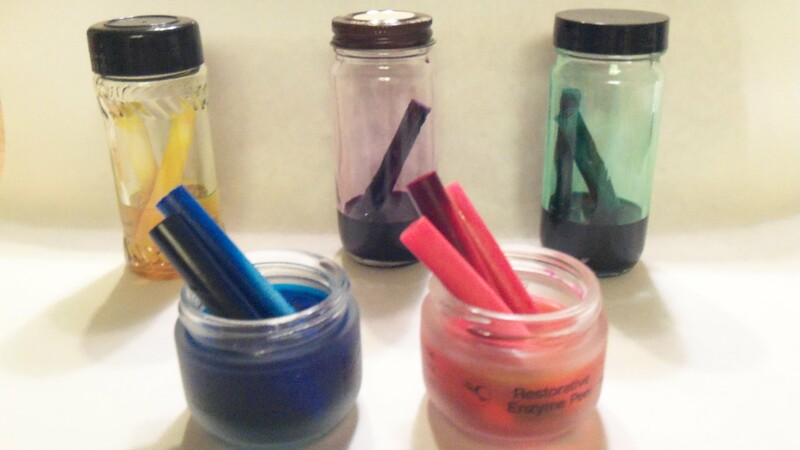 But the pièce de résistance was to make alcohol ink out of them. Handy stuff, alcohol ink. Stay tuned because it will make a starring role in a project coming soon. Maybe two projects! Maybe three! I sorted my dead markers into piles of red, yellow, green, blue, purple and brown. As it turns out, taking markers apart is pretty easy. I came prepared with some serious weaponry but only pliers were needed. For the thin markers you can grab the marker tip and pull straight out. 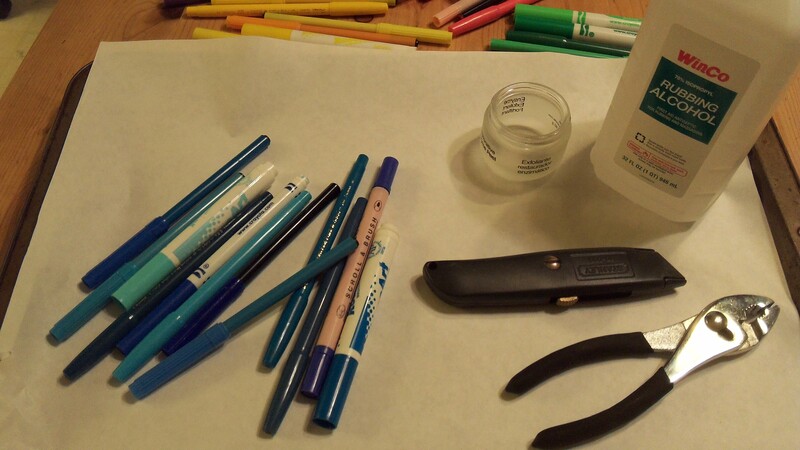 For the fat Crayola-type markers, you have to take out the tip with the pliers, then use the pliers on the back end to remove the ink barrel. I washed my pliers in between colors, which is a first here at Breaking Urban Ground headquarters. Washing pliers isn’t something we normally do. I saved the plastic pen bodies to make jump ropes another day. Here are the jars of alcohol inks. I’ll let them sit for a day and leach the ink from the marker cores. But I think they are beautiful already! My Zen crafting moment shines in all it’s glory. Do you see the beauty of this project? It cost me nothing in materials, and used up every part of something I would have thrown away, and saved me the cost of a future birthday party gift, and provided paint for my upcoming office project, AND a free science experiment for Youngest Son. I’m milkin’ this 6 ways from Sunday, I tell ya! Updated 5/26/13: The alcohol ink didn’t work as expected. I had used 40% isopropyl alcohol. If I were to do it again, I would get the 90% stuff from The Gardening Stud’s goodie supply when he was making an alcohol burning stove out of an aluminum can. It simply doesn’t evaporate fast enough to work on metal and ceramic. It does however, make lovely water colors. This entry was posted in Indoor projects and tagged alcohol ink, free, jumprope, markers, recycle, repurpose. Bookmark the permalink.